LINK TO THE 2018 Xlab Event Page. SEGD XLab is held at SVA Theatre | 333 W 23rd St, New York, NY. Pack Your Bags—Xlab 2016 is Next Week! Got your toothbrush? Phone charger? Jacket? Favorite pen? Laptop? A Friend? Wait...what? Yes! 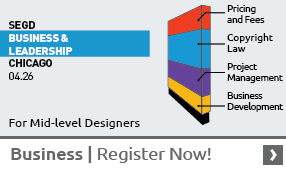 You can bring a friend or colleague for free when you register for Xlab 2016. Xlab 2016 is the farthest thing from a ho-hum business conference—and to prove it, we'll give you five good reasons you'll leave New York inspired, amused and just plain happy you went. What are YOU doing on Thursday, October 27 from 1:00 to 3:00pm? Attend an Xlab tour as part of the excitement of SEGD's Xlab conference in New York City! City ID's Mike Rawlinson helps set the standard for improved information and wayfinding solutions that are integrating people, movement and place around the globe. On October 28 at Xlab in New York City, he'll share how forward thinking on these topics is key to creating truly smarter cities. Be there! New models of interactive experiences are emerging that impact our projects, spaces, cities and our lives. At Xlab on October 28, interaction designer Nils Wiberg of Gagarin will lead a not-to-be-missed visionary exploration of next generation interactions. Conceptual design company Leviathan is uniting digital technology, real-time data and the physical environment in ever-changing, increasingly delightful ways, providing clients and communities an amplified experience of brand identity, engaging narrative content and sheer beauty. At Xlab 2016, leaders of their team will tell you how they do it. Scroll through the slideshow above. We asked several of the most tech-savvy experts within the SEGD community for their picks of the most recent and influential experiential graphic design using digital technology. The main criteria informing their choices were: shows significant innovation, inspiration and has raised the bar for experiential graphic design. NOTE: This list has been compiled from our experts' top recommendations and is in no way comprehensive or presented in any specific order. 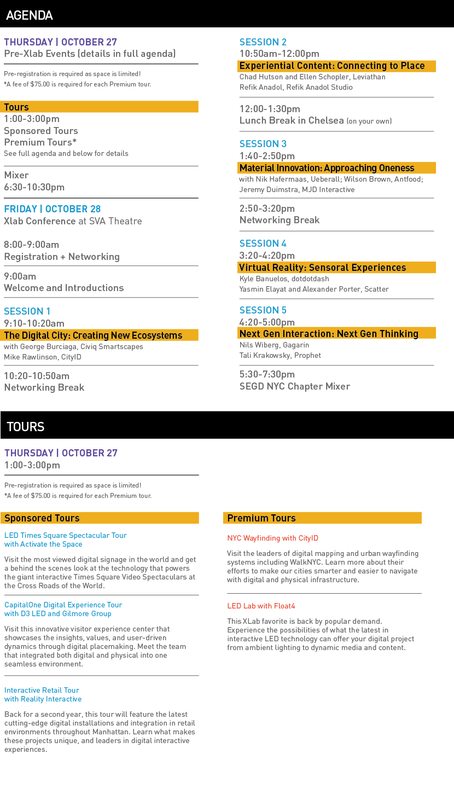 For the second year, SEGD's Xlab conference will be part of New York Digital Signage Week (#NYDSW) in New York City. The week-long series of events centering around digital signage begins on October 24, and culimnates on the evening of October 28. The events promise to be engaging, with plenty of fantastic networking opportunities. October 27—28, New York will be filled with recognized leaders of the digital experiential graphic design world at SEGD's upcoming Xlab conference. SEGD is focused on delivering valuable content through this website that is relevant for designers and their firms’ success. One example of segd.org's value to members is free access to the vast and growing gallery of videos called SEGD Talksthat cover innovative events, inspiring speakers and empowering talks from all of SEGD's physical events—including Xlab, the conference about cutting-edge digital experiences at the intersection of design and technology. 10 Projection Mapping Projects That Inspire! Projection Mapping has many names: projection mapping, pixel mapping, video mapping, or even architecturally registered mapping. Every year there are increasing numbers of impressive projection mapping projects cropping up. Past SEGD Board member Dan Moalli, of Technomedia Solutions helped us create a short list of inspiring projects.